When my muse first dropped this "dirty" little idea on me several years ago, it was presented as more of a challenge than an opportunity. Almost an "I dare you to try and fit 13 theme entries into a 15 x 15 grid!" So started a steady cycle of submissions, rejections, and complete rewrites. At one point in the process, Joel even commented that "the massive amount of theme material might make this too tough to construct cleanly." With the 50th anniversary date looming, it finally occurred to me that using mirror symmetry might provide less constraining grid designs. My next submission came back with "almost a yes," and after a few more tweaks, my work on this one was finally over. This puzzle was by far the most difficult and time-consuming of my limited work to date. The challenge was not so much a matter of selecting good fill, but more a function of finding "any" fill that might work. The statistician in me points out that only ten words in the final grid do not contribute at least one letter to a theme entry. Squeezing in all the theme material also required 9 of the 13 entries to intersect with each other in some fashion. So while "glue" like SLYS, RRS, OPP and OPE were less than optimal, I am content knowing I considered countless alternative options. For those who want to keep score, other "dirty words" used in earlier failed submissions included: POLITICS, LANGUAGE, DANCING, SHAME, MIND, RICE, POOL and DOG. Fast forward to this week: I was very pleasantly surprised to see the puzzle run on a Thursday, the actual anniversary date of the movie. I felt my accepted submission was geared to earlier in the week. But Will and Joel appropriately took the cluing up a notch, while still leaving the spirit of most of my original clues intact. If I had a choice to reclaim one clue, it would be "Carrie Underwood hit that includes Ajax as a lyric" for "Dirty" LAUNDRY. Many thanks to Will and Joel for their steady and patient advice. I hope the gimmick doesn't reveal itself too early, and that solvers enjoy the end result. Postscript: If pressured, I might admit that the answer to 57-down was intended to subliminally influence the opinion of certain NYT crossword reviewers. (You might notice that multiple other words could have been used instead.) With news this week of Adam West's passing, I would rather dedicate both the clue and the answer to his memory. Who would have guessed that there are 12 phrases having DIRTY as a first word? 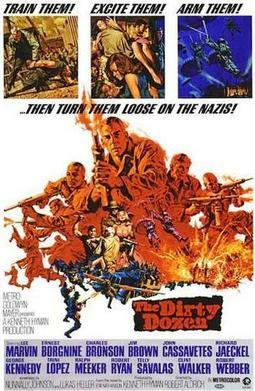 Some cool finds like (dirty) RAT, (dirty) LIAR, (dirty) MARTINI helping to play on THE DIRTY DOZEN. I've highlighted the twelve "dirty" entries below to help them stand out. Neat that they're symmetrical! Some of the theme answers worked better than others for me. (dirty) JOB, yes! (dirty) WORD, hmm ... passable. (dirty) LAUNDRY, yes! (dirty) MONEY … okay, but not as great as (dirty) HARRY. Granted that Richard needed 12 phrases to pull this one off, I thought he did well overall with the theme, especially considering that he found 12 that could be worked in symmetrically. So much inflexibility in the grid. I had a feeling something odd was going on when I started the puzzle with OPE crossing OPEL. Not a great result, but also not unexpected, considering JOKE and JOB were fixed firmly into place. SLYS and RIRE quickly followed. Hmm. And those two lower corners. With THE DIRTY DOZEN creating an inflexible ceiling, and WORD and LOOK creating inflexible floors, it wasn't a surprise to get TOJO (I like seeing him in crosswords about as much as I do NAZI), OJAI, HOAR, and then SZELL crossing LPNS, which doesn't seem fair to me. No bueno for the poor solvers who don't know their former conductors (and shouldn't have to). I bet changing the placements of WORD and LOOK could have helped; moving them up one row, switching them, etc. A tough set of constraints to work with, but also a lot of possibilities in where those 12 short answers could go. But I did appreciate some nice fill in INSTANT WIN and KELLY GREEN, even LORETTA SWIT (although I did wonder for a second if (dirty) LORETTA SWIT was a thing). Helped to make up for some of the flaws in the short fill. Overall, a nice idea that would have played better earlier in the week — I like something more tricky out of a Thursday puzzle. Answer summary: 9 unique to this puzzle. The grid uses 23 of 26 letters, missing FQV. Average word length: 4.84, Scrabble score: 318, Scrabble average: 1.73.